Staff of Craig M.Jeffrey Ltd., publishers of the Helensburgh Advertiser and the County Reporter and commercial printers, pictured outside the 7-9 East King Street printworks on a sunny day. 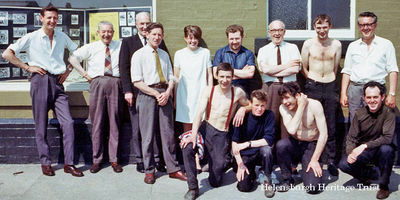 Standing (from left) are Donald Fullarton, W.T.Slater, Jimmy Allan, Tom McLennan, Norma Jarman, Willie McGillivary, Billy Gilmour, Jim Cavana and proprietor Craig Jeffrey. In front are Stewart Stenhouse, unknown, George Gill and Tony McGinley. Image circa 1970.